It may seem surprising that Yellow Loosestrife is placed in the Primrose family - and indeed some botanists site it in the related family Myrsinaceae. 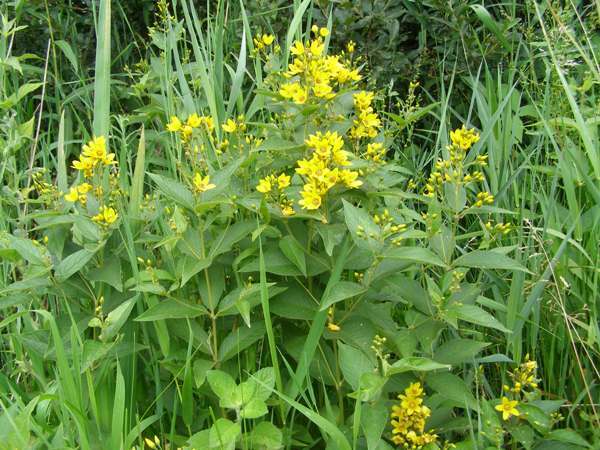 Despite bearing similar common names Yellow Loosestrife and Purple Loosestrife (which flowers at the same time of year and in the same habitats), are not closely related. The plants of these two species have somewhat similar upright racemes, but the flower structures are different. Lysimachia vulgaris grows to typically a metre in height and has opposite lanceolate untoothed and almost stalkless leaves in whorls periodically up the stems. Leaves and stems are finely downy. The flowers, borne in open pyramidal clusters, are each 1.5 to 2cm across and cup-shaped with five pointed yellow petals. 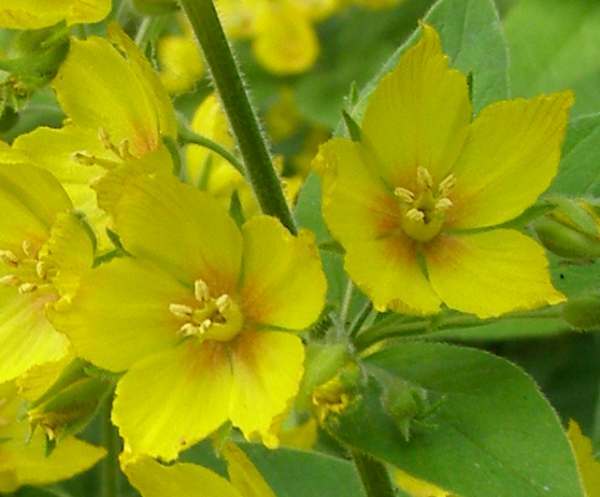 The flower sepals have orange margins, which are toothed..
Yellow Loosestrife is common throughout Britain and Ireland and can also be found in many mainland European countries, including Slovenia. 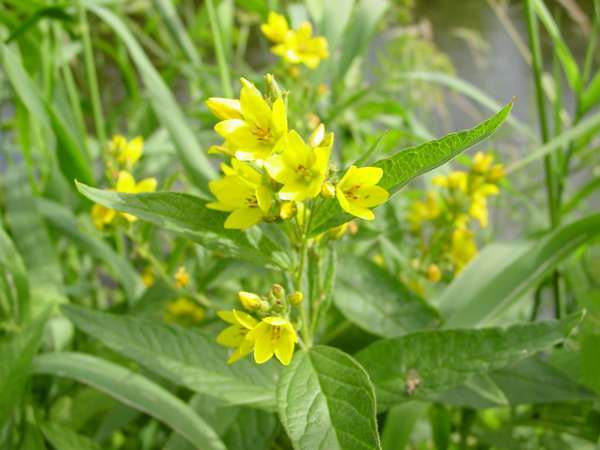 Lysimachia vulgaris is a marginal plant and thrives in wet peaty soil beside spate rivers, lakes and marshes, and it can be found flowering almost anywhere in damp habitats in high summer. You will also see cultivated varieties (which have flower stems much more packed with blooms) in parks and gardens, often in quite dryish areas that would be shunned by the native wildflower. Wild Yellow Loosestrife has a much more lax flower spike than the garden varieties. As a general rule it is mainly the early spring flowers that are yellow, but here is a late summer plant that has stunning bright yellow flowers to brighten up the countryside when the rest of the landscape is becoming more dominated by blues and pinks. Lysimachia, the genus name, is in honour of Lysimachus, (c. 360BC - 281BC), a Macedonian general who, as one of the successors to Alexander the Great, became ruler (king, in effect) of a large part of the divided Macedonian Empire that had all been Alexander's realm. King Lysimachus is reputed to have fed 'loosestrife' plants from this genus to his oxen in order to calm them down whenever they became agitated and difficult to manage. 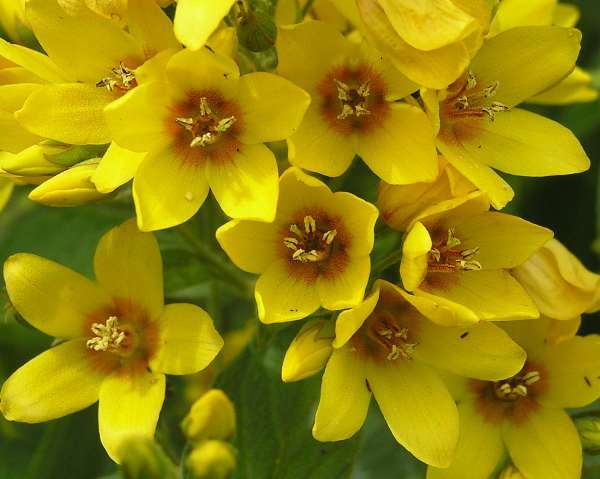 The name Loosestrife means 'lose (or forget about) strife'. No worries, then! The specific epithet vulgaris means common. Yellow Loosestrife tied around the necks of oxen was reputed to keep irritating flies away from them. In the distant past these and several other kinds of 'loosestrife' plants were also used to get rid of infestations of flies in houses. The plants were dried and burned indoors, and toxins in the smoke drove out the flies (and no doubt also any human occupants). Whorled Loosestrife Lysimachia verticillaris (shown above) is similar but has a distinct orange tinge at the bases of its petals; the leaf junctions are purple. The photographs of Yellow Loosestrife shown on this page were taken in South Wales UK during June and July.